Brian Howard, J.D. is a Certified Career Management Coach (CCMC), a Certified Job Search Strategist (CJSS), a Certified Professional Resume Writer (CPRW), an actively practicing executive recruiter, and President of The Howard Group. With over 25 years of real world recruiting experience, he has received various accolades and international acclaim for his recruiting ability, and is a member of an international recruiting organization’s Hall of Fame. Under Brian’s leadership, The Howard Group has received the prestigious Best in Class Award for Overall Client Satisfaction and has been honored with the International Office of the Year Award. Brian Howard has helped thousands of job seekers over the course of his career. He has pulled together his years of recruiting and job search experience into the writings of The Motivated Series of job search books. 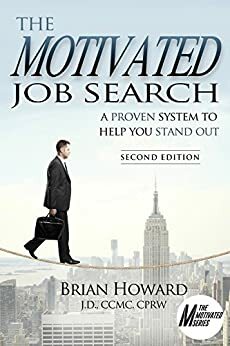 These books include: The Motivated Job Search, The Motivated Job Search Workbook, The Motivated Networker, Over 50 and Motivated, and Motivated Resumes and LinkedIn Profiles.